American Student Government Association graduation cords (a royal blue and red double tied cord) are a great way to recognize student leaders at their commencement exercises. The ASGA is a professional association for students in Student Government at the colleges and universities in all 50 states. The American Student Government Association serves and supports the Student Governments at all of the institutions of higher learning where they are present. Wearing ASGA graduation cords shows appreciation to those who serve other students, and recognize dedication in leadership positions. Our products and policies are designed to fit around your schedule and your needs. Schools, universities, and other organizations that may need to obtain a large quantity of cords, go through a procurement office, or have purchasing restrictions, don't worry, we will work with you. We accepts purchase orders and all major purchasing cards. You can pay with a PO by selecting that option during the checkout process. We offer shipping both inside and outside the United States. If you have questions about bulk discounts, just give us a call. Every color that we have in stock will be listed on our website. If there are any issues with stock, we will make that known as soon as possible. Custom colors or cords can be purchased in advance (please provide at least two months) for quantities exceeding 100. 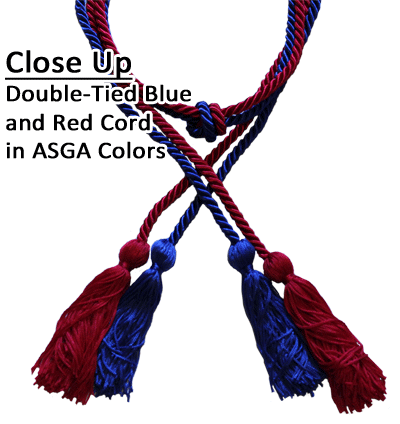 ASGA honor cords can be a royal blue and red double cord. Other ways to show achievement for student government leaders are Honor Stoles or Sashes, or Medallions. In addition to Royal Blue and Red Graduation Honor Cords, we also carry both royal blue graduation sashes, and red stoles. Honor Cords that we make available to American Student Government Association graduates are approximately 70 inches long from the end of one tassel to the end of the other before being tied. The American Student Government Association was only formed in 2003, but already it has over 1,100 member institutions all across the country, with the newest member institution (in 2012) being Limestone College in Gaffney South Carolina. The ASGA's mission statement is to Connect, Commit, and Serve. They emphasize networking (connect) as an excellent way to build mutual success among peers. Commit is part of the Mission Statement because anyone in student government needs to be committed to their school, their fellow students, and to their own school work. Student Government work must be selfless (serve) in order for it to be truly meaningful and effective.